"In Our Own Words: Native Impressions—Title Page" by Daniel Heyman, Lucy Ganje et al. 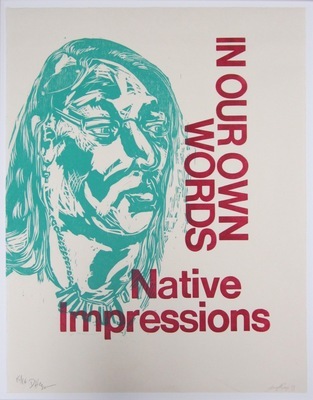 The original print is from the In Our Own Words: Native Impressions portfolio. Focused on individuals from the Tribal Nations of North Dakota, this collaborative project was intended to chronicle lives of contemporary Native American people through a series of original artworks.